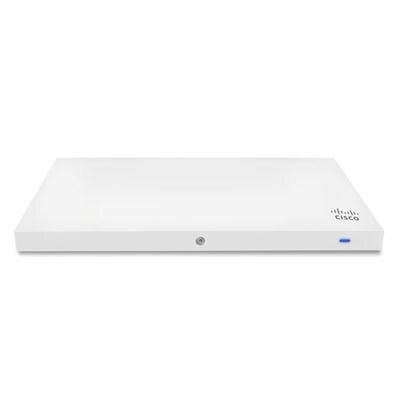 The Cisco Meraki MR33 is a quad-radio, cloud-managed 2x2:2 802.11ac Wave 2 access point with MU-MIMO support. Designed for next-generation deployments in offices, schools, hospitals, shops, and hotels, the MR33 provides performance, enterprise-grade security, and simple management. The MR33 provides a maximum 1.3 Gbps* aggregate frame rate with concurrent 2.4 GHz and 5 GHz radios. A dedicated third radio provides real-time WIDS/WIPS with automated RF optimization. An integrated Bluetooth Low Energy (BLE) radio delivers beacon and scanning capabilities. The combination of cloud management, 802.11ac Wave 2, full-time RF environment scanning, and integrated Bluetooth technology delivers the throughput, reliability, and flexibility required by demanding business applications like voice and high-definition streaming video, today and tomorrow. Licensing and DC Power adapter sold separately.